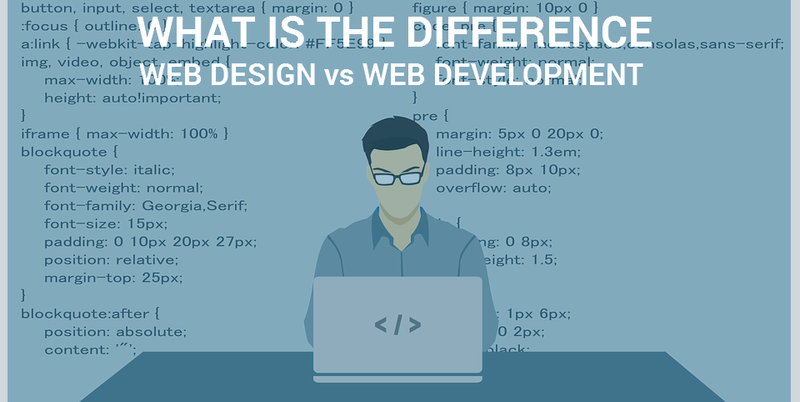 BLOG / web design / Web Design vs Web Development, What’s the Difference? The reason for this is mainly cross-learning! In today’s highly competitive world, a developer cannot afford to stay aloof from what a designer does and vice versa. They happen to learn a little bit of each others’ tasks through mutual knowledge transfer that happens on the job. This may somehow equip them with a general awareness of each other’s roles. But for gaining proficiency in the other stream they must have a natural talent as one is creative and the other, logical. Two extremes! Therefore, however, one conquers the other hemisphere, role reversals can cause the whole web building process go awry. But, they are used interchangeably! Generally, web development is considered as an umbrella term for a list of tasks that go into the development of a website. This includes web design as well. But, they are quintessentially two separate functions. Google treats the keyword web design and web development almost similarly. This is not actually because these terms convey the same meaning. It is because that the intention of most people searching for queries with these terms are interchangeable. Some times people use the term web designer to look for services that also involves web development and vice versa. Web design functions are directed towards providing a better interface and experience to users. Whereas, web development involves programming and server-side functions that make the website functional. It includes graphic designing, interface designing, page setting, choosing visuals, colors and fonts, etc. They use programs such as Adobe Photoshop, Indesign, Illustrator, Sketch, etc. It includes server-side programming, database management, etc. They work on IDEs or text editors, local servers, multiple browsers, FTP and other developer-specific programs. It all starts with the client’s briefing on their requirement. The web designer listens to the requirement and prepares a wireframe* of the website. The web developer takes it up from there and transforms the designs into a working website. The output is then put for testing to detect and correct flaws or bugs. *A wireframe is a simple graphical representation of the user interface that serves as a guide to designing the layout of the website. The web designer initiates the process of website building by drawing a wireframe* of the website according to the requirements. What does web developers do? The job of a developer starts after the design is created. He should be specialized in database management systems such as MySQL, Oracle, etc. Web design and web development are the art and science of the web building process. They are different in the skill-set required but they complement each other. However, today we can see a rise in hybrid web professionals who break their comfort zone and train themselves in all areas of web building, earning the name of a full-stack developer. Yet there are times they fall short when it requires a high-level of creativity or knowledge in programming. Knowing this, web development companies usually maintain a web design team for providing design-related services and a web development team for site enhancement services. Only when you understand the difference you can seek the right help with your website.